Pair of Protosmia (Protosmia) tiflensis (Morawitz, 1876) copulating on a flower of Stachys recta (Lamiaceae). Foto A. Gogala. The genus Protosmia Ducke is mainly distributed in the Palaearctic region with one species each occurring in the Nearctic and in the Oriental region (Michener, 2007; Ungricht et al., 2008). Currently, there are 29 described Protosmia species, 27 of which occur in the Palaearctic. At least 2 Palaearctic species are still undescribed. Information on the nesting biology is available for 14 Protosmia species belonging to 3 subgenera from the Palaearctic and Nearctic region (A. Müller, C. Praz, J. Neff, G. Le Goff and C. Sedivy, unpublished). All species use preexisting cavities as nesting sites. Species of the subgenera Chelostomopsis and Nanosmia were reported to nest in trap nests, insect burrows in dead wood or in hollow stems, whereas the diversity of nesting sites in the subgenus Protosmia s. str. appears to be higher: empty snail shells, abandoned cells in exposed nests of other aculeates, small crevices in stones and insect burrows in dead wood or in vertical ground. Both cell partitions and nest plug are constructed from resin. P. (Chelostomopsis) rubifloris occasionally embeds pits of gravel into the nest plug (Griswold, 1986). All Protosmia species, whose flower preferences have been analysed so far, are polylectic. Important pollen sources for many of these species are Fabaceae and Lamiaceae. In the subgenus Nanosmia, several undescribed species as well as P. devia are equipped with specialized bristles on the labial palpi of the proboscis, which most probably serve to remove pollen from anthers hidden in narrow flower tubes (T. Griswold, personal communication; A. Müller, unpublished). 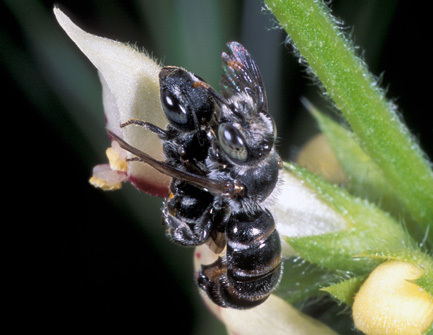 Indeed, females of an undescribed Nanosmia species were repeatedly observed to visit the narrow-tubed flowers of Heliotropium (Boraginaceae) in southern Morocco (A. Müller, personal observation).